When My-Take, a dynamic Boston-area startup, decided to move to a new office, they knew they wanted a space that was optimized to meet their needs. They wanted to facilitate staff collaboration and interaction, while also providing get away spaces and a comfortable environment for their employees. Additionally, they wanted an aesthetic that would both enhance productivity and promote their brand, while integrating seamlessly with existing IT and electrical infrastructure. It was clear that there was no “pre-fab” office plan that would meet the company’s goals—My-Take was going to need help. Using a simple internet search, they reached out to Joyce Contract Interiors and started the process of building their ideal office. Allow for employee interaction and collaboration. Use aesthetics and natural lighting to provide a comfortable workspace. Offer private areas and get away spaces. Accommodate the existing staff size, while making room for growth. Meet basic needs of storage, electrical and data. Feature color selections that advance the company’s brand. Provide a conference room, private offices, and breakout spaces that maintain a cohesive aesthetic. In addition to these goals, the project would have to come in under a startup budget, and it had to be finished in just four to six weeks. 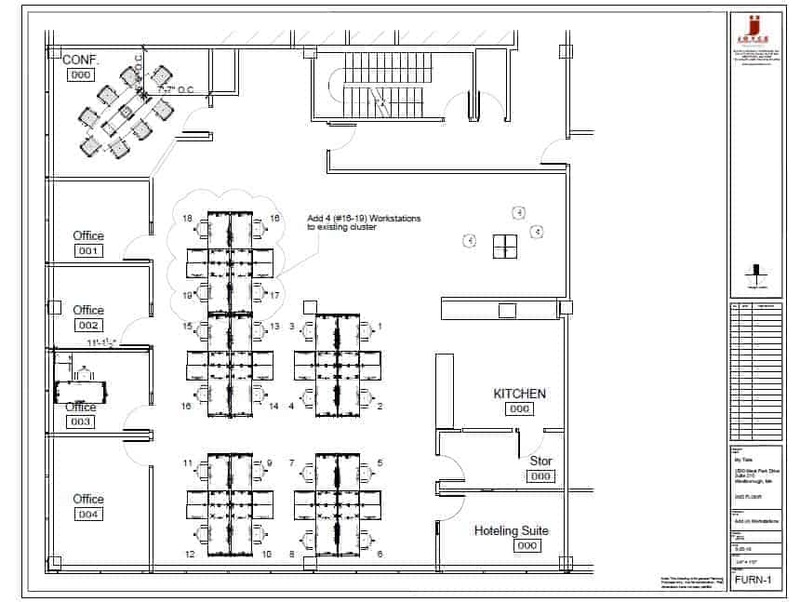 My-Take furnished a CAD plan of their newly leased office space to JCI, and both teams worked closely together to brainstorm layout and furniture solutions. After the initial consultation was finished, the JCI team searched for furniture that met the company’s functional and aesthetic goals. Items were suggested to My-Take key personnel, who were able to demo chairs, benching units, and other pieces in order to judge their quality and suitability. 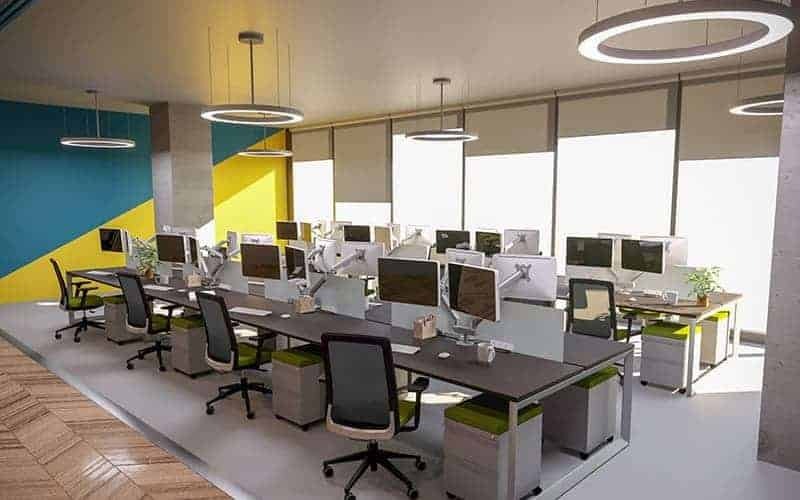 JCI professionals also assisted My-Take with paint and color selections to develop the best scheme for the company’s new setting. After examining their options, My-Take selected their favorite pieces and designs, and gave feedback to JCI about how they’d like them to fit in to their new office. Once My-Take had discussed their preferred furniture options, the JCI team went to work on how to work them into an optimal office layout. Using their creativity and experience, JCI’s furniture professionals developed multiple plans that met My-Take’s goals. In each plan, spaces were presented that facilitated both collaboration and private work, pieces were selected and arranged to allow for natural light and airflow, and functional concerns such as IT and electrical were accounted for. After My-Take had selected the most appealing design, the JCI team visited the new site to physically measure the available space and confirm that it matched the CAD plan. Once it was confirmed that JCI’s floor plan would work in the new space, JCI’s professionals ordered the necessary furniture items. As soon as My-Take’s furnishings were on their way, JCI met with multiple vendors to discuss the logistics of electrical and IT integration. They also furnished a Certificate of Insurance (COI), which was required by building management. Once these steps were taken, a final date for delivery and installation was chosen. My-Take’s furniture was delivered and installed within JCI’s projected two to three-day schedule. When the installation was complete, the JCI team performed a walk-through of the finished site to confirm that the layout was consistent with their plan and My-Take’s expectations. 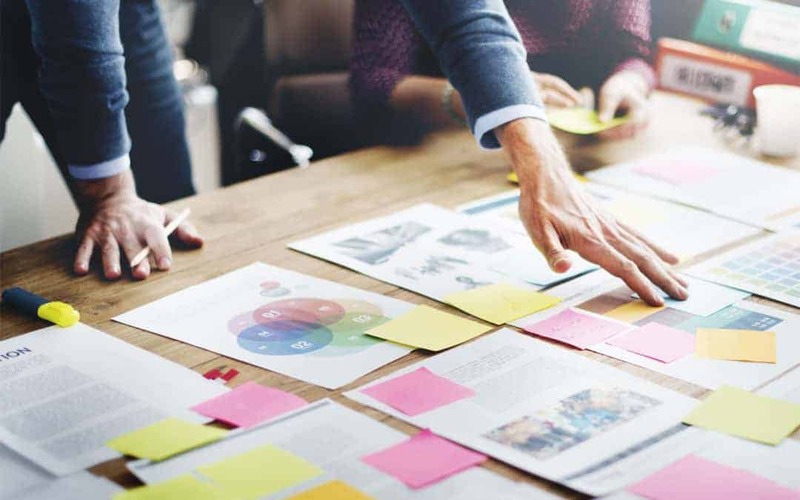 After working closely with JCI, My-Take found themselves in a flexible office that maximized employee comfort and productivity and solidified the startup’s emerging brand. “Our team could not be happier with our office setup, especially since our old environment was cubes”. My-Take found themselves in a new setup that they believed made for a modern, clean, open space that helps produce a positive work environment. 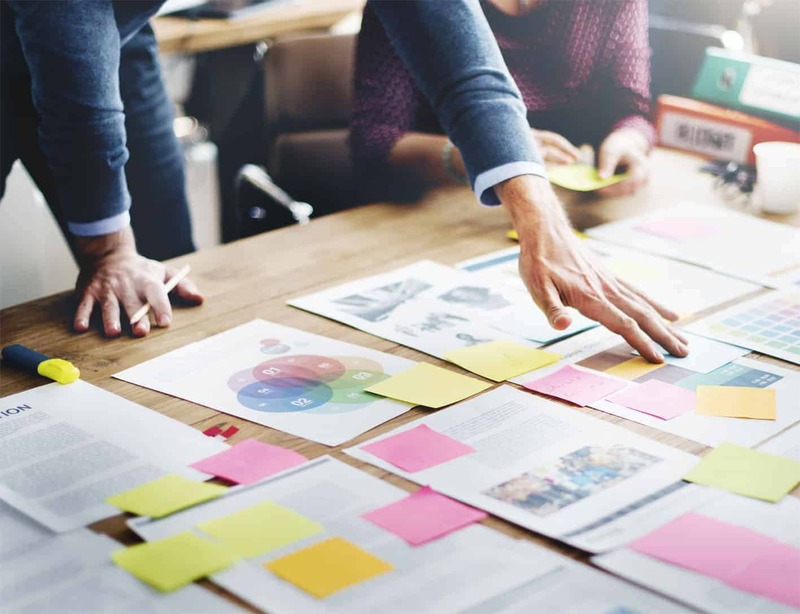 The project was finished within My-Take’s time and budget requirements, and the company’s founders were pleased and impressed with the results. 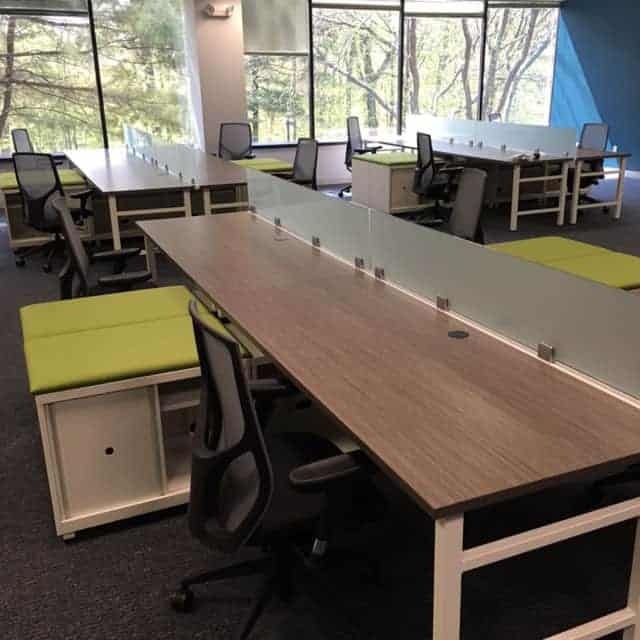 On March 30, 2016, My-Take received its initial order of 12 benching units, two fully furnished offices, a conference room and a collaborative huddle area. My-Take consulted with JCI again soon after the initial project in order to accommodate their rapidly growing business. In July 2016, JCI helped My-Take order and install an additional four benching units. In August 2016, a third order was completed, also consisting of four benching units. In addition to helping design the appropriate workspaces for My-Take’s needs, JCI worked with My-Take on color and finish selection’s that would solidify the startup’s brand. JCI’s performance in this regard is evidenced by the fact that photos of My-Take’s new office featured prominently on their website and in marketing materials. My-Take personnel were very satisfied with the results. “We have pods of four units and we have teams working in each pod. So, they work well for collaboration and each unit offers enough space for storage. If we had to start over again with all the knowledge we have now, we would deploy the same setup”. The JCI team could think of no better testimonial to the quality of their work, however, than the multiple referrals they have received from My-Take’s founders after completing the project.